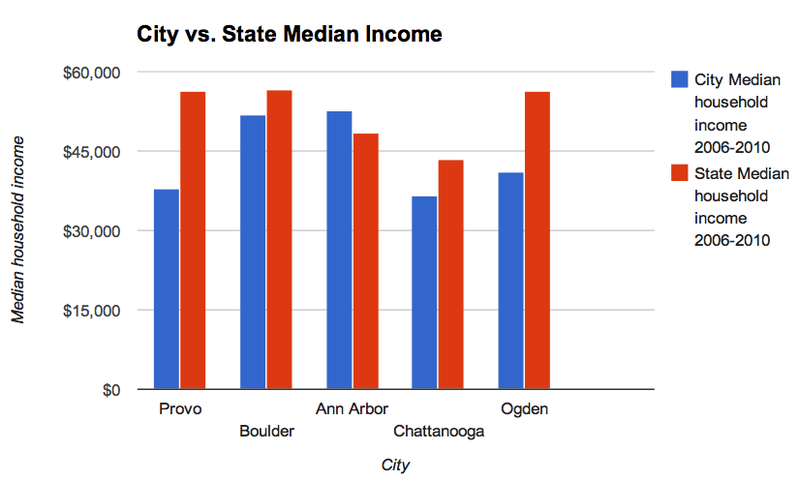 Could the income disparity between Provo and Ann Arbor stem from single income vs. dual income households? I’d be interested to see that data. Probably some of it. Mormon tithing is also a bit of an elephant in the room here. The reality is that a huge chunk of Provo actually has 10% less income to spend in the city than it seems. I’ll try to tackle these ideas in a future post. It seems to be a clear connection, albeit, probably a sensitive one. Here in Peoria, Illinois, a city of 115,025 it is the description of a desolate downtown and has similar problems. One thing I was shocked to see is that without a major university we have less citizens with a Bachelor’s 32% vs 40%, but yet a higher median income of $45,863 vs $37,892 – which goes against common thinking. I wonder if the numbers are skewed for population sake including the students but would lower income as a result? There are 11,337 people age 18-19. Race can seemingly be thrown out due to Peoria having 22.4% less caucasians (another standard argument). There are significantly less people 65+ in Provo which can account for dollars being spent in and around town. Median value for home-ownership in Provo is $100k higher which I’m sure in your future posts might go into detail about that. With nearly identical commute times, I wonder if that says a lot about downtown revitalization. Peoria’s metro area is roughly 379,000 and with Provo’s much larger at 527,000, I think that summarizes more about the complexity of the issue. — It is too easy to get around via car. Need to work downtown Provo/Peoria, no sweat, 16 minutes in the car is more time efficient that other alternatives. Much of the built environment is sprawling to keep up with our cars demands. More has gone into inducing economic development on the outskirts than paying for building, repairs and maintenance in the downtown. With so many amenities strecting across the metro areas there is no clear reason to choose the downtown over others. 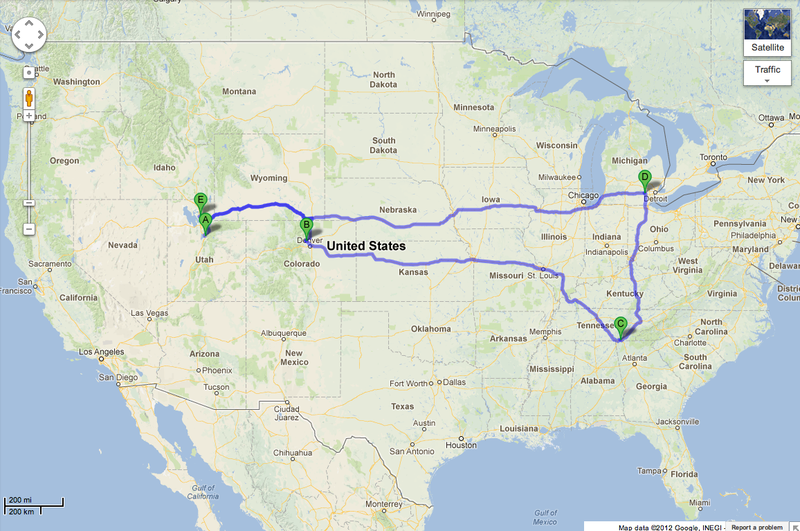 You can work, play, and live all within an easy drive from each other. There is no need or advantage to do it differently in most people’s minds. I’ve been addicted to the 2010 Census info since it came out trying to decipher what it means. Richard Florida’s Creative Class – Revisited is the best summary I can make of it. -Sorry for the longwinded comment. That’s a really fascinating comparison. I think you’ve hit some of the differences and causes right on the head. I’m also interested in the commute times; that’s a really great point that seems to look at density from a somewhat fresher angle than just people per square mile. In any case, I’ll be looking at Peoria now too to see what I can learn about your city. Thanks for the comment! Fascinating data. Provo is a unique town. I’d be interested to read your thoughts on how to spur that kind of economic development. It seems like there is often a chicken and egg problem. A vibrant downtown attracts revenue generating anchor businesses, but without those big businesses, there isn’t the money to develop a downtown. Also, when are you running for mayor of Provo? I’m sure very few people think about these issues as carefully as you do. Yeah, it’s a tough situation and I’m not sure how your actually raise incomes. Most of my posts have focused more on the physical side of city building, so I’m still researching this. And re: running for mayor: haha. I agree, you should run for Mayor, Jim. Nice post. This is a valuable thing to look at. There’s a major difference between Provo and other college towns that you’re not capturing with the above analysis, however. BYU (and UVU) for that matter are very much focused on undergraduate education. The Universities of Michigan and Colorado, at least, are major research institutions with medical schools, meaning that faculty salaries are (lots) higher, and a large chunk of the students have stipends, or fellowships. Even at an undergraduate level, BYU tuition is so obscenely cheap that students really can pay for their education with part-time or summer work, provided they live cheaply during the year. At Michigan and other big schools, large student loans are necessary and provide some extra liquid cash. I sent you two towns that might be a somewhat better comparison, Athens and Davis. Both UGA and UCD are more research-oriented than BYU, but not at the level of Michigan or Colorado. Fair enough. But the problem I’m looking at is a lack of funds to invest in the local economy and if that’s the case it doesn’t really matter why incomes are lower, only that they are. It might not be fair to compare BYU to Michigan or Colorado (I think it is, as BYU constantly compares itself to better schools), but in the end fairness has little to do with creating a vibrant downtown, for example. I’m only interested in the “why” in as far as it is helpful for bringing about change. If it becomes an excuse to accept the status quo — i.e. “Oh, Provo is just a very different place and that’s that” — then I think that’s dangerous. The situation in Davis is almost identical to those I already mentioned. The median income is $59,517, while the state median income is $60,883. The poverty level is 23.5%. The median value of homes is much higher. And, I think significantly, the population is less than half. That means the school may dominate the economy more thoroughly than BYU dominates Provo. I still like the comparison to Davis; I’ve heard nothing but good things about that city and Provo could learn a lot from it. 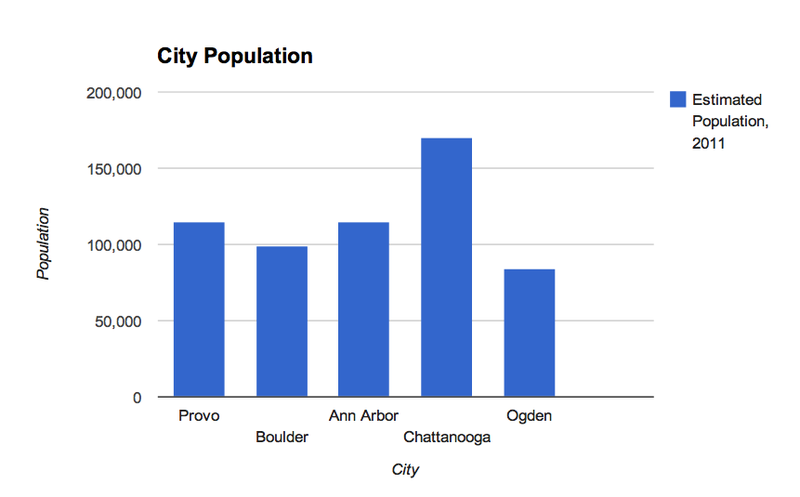 But the income data makes it look a lot more like Boulder than Provo, and the population makes it look more like Ogden. And either way, it’s doing better than Provo. That’s some great preliminary research. I’d never quite thought of Provo as “poor,” but it makes sense. Its historical centrality would make you think (without thinking) that Provo would be at least as well off as any other city in Utah county. That is certainly not the case, though. You are right. Houses are way cheaper in Tennessee. I think there’s also a desirability issue. Though Provo has a thriving university, how many professors actually live in Provo? And while there are some big companies, how many of their employees live there? They’re much likely to retreat to places like Alpine or American Fork. Boulder and Ann Arbor and Chattanooga don’t have as many local suburb options, rather they’re the more attractive places to live in their area compared to other places. People who teach in Ann Arbor will live there, etc. Another issue: with a lot of undergrads who are married or older, it’s likely more students in Provo are declaring residency there rather than Ann Arbor or Boulder where they probably keep residency with their parents. Would that have an impact?